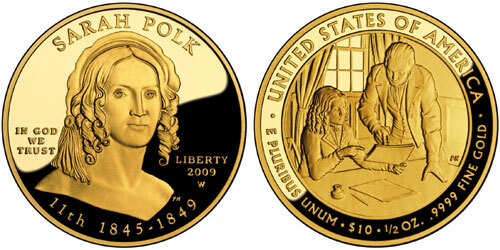 USA 2009 W Sarah Polk $10 Gold Coin from First Spouse Series Buyer. The United States is honoring our Nation's first spouses by issuing one-half ounce $10 gold coins featuring their images in the order that they served as first spouse. The United States Mint issues First Spouse Gold Coins on the same schedule as the Presidential $1 Coins issued honoring the Presidents.